« Day 304 in Beijing: Let’s Get Physical! Physical! 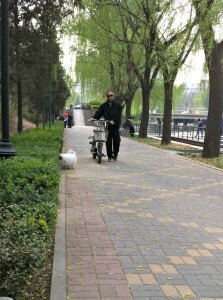 Day 305 in Beijing: Walking the Dog. Jill and I were sitting by the Liangma River and just watching people walk by. And, of course, watching the dogs as they walked by. This dog was taking his own sweet time and cruising by the river. His owner, as you can see, walked his electric bike beside him the whole time. To be honest, I’m pretty sure the dog was the owner and the guy with the bike was his pet. The guy with the bike never rushes the dog, never tells the dog what to do, and waits patiently as the dog checks out and smells everything. Our favorite part is when this cutie notices us filming him, stops, and gives us a nonchalant look, and then walks on as if he is used to it and we are just boring paparazzi following him around while he does his daily routine.